Cisco Cuts Could Be Second Largest Tech Cut Since January 2015 | Page 5 | Challenger, Gray & Christmas, Inc. While the company has not officially confirmed the news, reports out of Silicon Valley suggest that tech giant Cisco Systems is preparing to shed 14,000 workers from its payroll. If true, it would represent the second largest in a string of large scale layoffs announced in tech sector since January 2015. 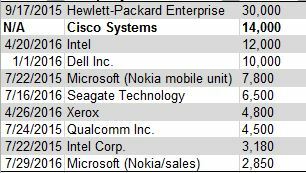 The Cisco cuts would the largest tech-sector job cut of the year. In April, Intel announced plans to cut 12,000 jobs. Dell announced 10,000 planned job cuts in January. 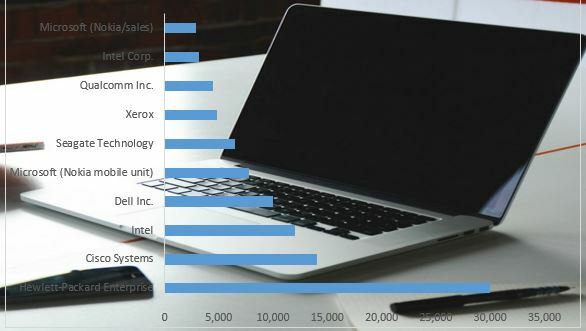 Tech firms have announced 62,917 job cuts so far in 2016, according to tracking by global outplacement consultancy Challenger, Gray & Christmas, Inc. That is 71 percent more than the 36,881 cuts these employers announced in between January and July of 2015. “We have seen a number of large-scale layoffs from technology firms going back to 2015. While the sector remains an area of solid growth, it appears that large firms are coming to terms with major shifts in business trends. In Cisco’s case, it is shift away from its traditional focus on hardware toward services like wireless security and data management,” said said John A. Challenger, chief executive officer of Challenger, Gray & Christmas. "Companies that do not adapt to changing trends will be left behind. Nobody knows this better than technology firms, where the very nature of the business means constantly evolving and shifting resources. We are seeing this play out with Cisco, just as it has played out with Intel, Microsoft, Hewlett-Packard, Dell, and several other tech giants in recent months,” said Challenger.